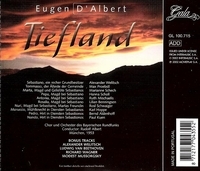 “TIEFLAND was revised by d'Albert and revived in Hamburg and Berlin in 1907, where it played to long runs. Its American premiere took place at the Metropolitan Opera in New York on 23 November, 1908 with Emmy Destinn and Erik Schmedes in the two leading roles. In addition to Schmedes and Destinn, notable past performers have included: Kirsten Flagstad who made her stage début in 1913 at the age of 18 singing the role of Nuri at the National Theater in Oslo; the young Maria Callas who sang the role of Marta at the Olympia Theatre in Athens during the 1945/1946 season; Montserrat Caballé who, like Callas, sang Marta early in her career; and the Danish tenor, Vilhelm Herold who was considered by d'Albert to have been the ideal Pedro. Richard Tauber first performed the role at Dresden in 1918, and recorded the two principal arias in 1928. It remained a favourite role, which he performed widely until 1940 in Switzerland. TIEFLAND is fairly regularly performed in Germany and Austria, with recent new productions at the Hessisches Staatstheater Wiesbaden in April 2007, the Volksoper Wien in October 2007 and at Deutsche Oper Berlin, with Torsten Kerl as Pedro and Nadja Michael as Marta, in November 2007. Performances outside German speaking countries have tended to be more sporadic. TIEFLAND was performed at the Ankara Opera House in 1951 in a production directed by Carl Ebert with Semiha Berksoy as Marta. It also received a major revival at Washington Opera in 1995 with its first major US production in 81 years, conducted by Heinz Fricke and directed by Roman Terleckyj. "ALEXANDER WELITSCH was the principal baritone at the Stuttgart Opera for many years. The war interfered with his career to some extent; the Vienna opera house was closed from 1940, and that’s why he went to Stuttgart. He remained there until 1963, with rare forays to Rio de Janeiro, San Francisco and Chicago….Two rarely heard Rachmaninoff and two Gretchaninoff songs show off his considerable capabilities in lieder…."